Reflections by NASA Social Participants. CAPE CANAVERAL FLORIDA: The GOES-R satellite launched at 6:42 PM Eastern Time on Saturday November 19, 2016 from Cape Canaveral Air Force Station. Over 40 meteorologists from around the country were on hand to witness the launch of a satellite that will dramatically improve weather forecasting. GOES-R is replacing the GOES satellite that launched in 2005. GOES-R offers 3 times more channels, 4 times more resolution, and 5 times faster scans. Harris representatives explained the analogy like this: imagine that GOES is providing a 1960's-era black and white TV signal. GOES-R will be like upgrading to a High-Def TV. 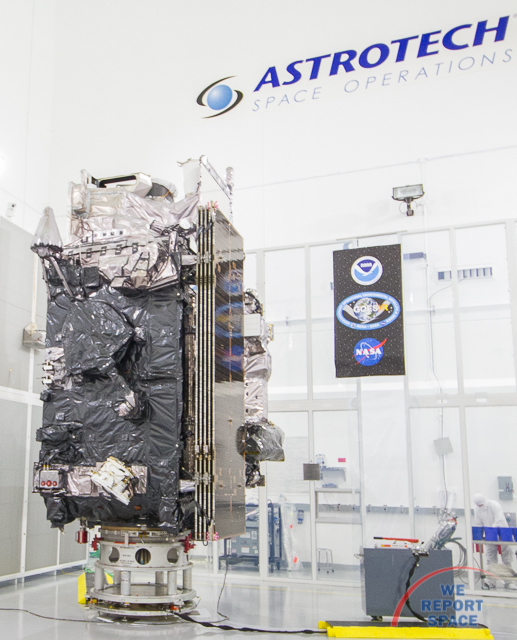 GOES-R will scan the entire hemisphere in five minutes while being able to focus on localized weather such as Hurricanes, severe weather, fire and smoke monitoring, volcanic ash, and any other severe weather. "With the current technology, we can see the eye of a hurricane. With GOES-R, we will be able to see inside the storm and visualize the entire eye wall. Improved ground systems will be able to begin processing images in seconds after they are taken", according to Romy Olaisen, Vice President, Harris Corporation Enterprise Ground Solutions. While awaiting the launch, media listened to an interview with TV weatherman Al Roker. He noted: "What's so exciting is that we're going to be getting more data, more often, much more detailed, higher resolution. In the case of tornadoes, if we can give people another 10, 15, 20 minutes, we're talking about lives being saved." GOES-R is a 5.5 meter tall satellite. It required an Atlas-V rocket in the 541 configuration: 5-meter payload faring, 4 additional solid-rocket boosters, and a single Centaur upper stage. The 60-minute launch window was set to open at 5:42 PM. Issues with the rocket delayed the launch for more than 40 minutes. Shortly after the issues with the launch vehicle were cleared, the Eastern Range reported an issue - this often means a wayward boat sailed into the caution box. Launch controllers targeted the end of the launch window for a launch attempt and the Eastern Range was able to clear the issue in time. GOES-R is a partnership of NASA and NOAA, lifting atop a ULA Atlas-V rocket. Photographers were hoping for a twilight launch, but as darkness fell during the delays, the camera rigs were updated for a night launch. We Report Space's Michael Seeley prepares a streak shot on the NASA bus immediately after launch. The satellite will reach its position within two weeks and will start sending some data back in early 2017. The satellite should be fully operational in time for the 2017 Hurricane season. Stunning, full color photo book covering every east coast launch spanning 2014-2015, including the first-ever powered landing of a SpaceX Falcon 9 rocket. Copyright © 2014 - 2019 We Report Space. All rights reserved.